Breaking News: Strong rain in Cebu causing huge flood that affects thousands of people specially in Cebu City on August 28, 2014. One boy was missing while he was swept by raging water in Guadalupe river. Thousands of passengers stranded as vehicles can't continue to run because of the flood. 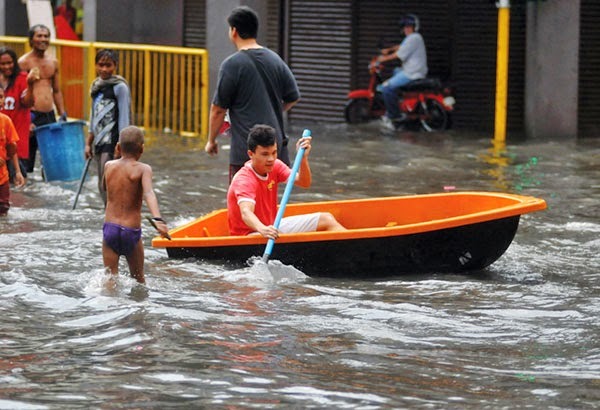 CEBU, Philippines - A teenager was reported missing in Barangay Pasil, Cebu City while swimming at the mouth of Guadalupe River at the height of the heavy rain yesterday afternoon. Rowen Abellaneda, 16, a resident of Barangay Sawang Calero, was with five other friends swimming despite the flood. Abellaneda was swept by the strong water current while his friends were rescued. Cebu City Disaster Risk Reduction and Management Office executive director Simeon Romarate said the area where Abellaneda and his friend were swimming is considered danger zone during heavy rains. “Naligo man sila duol sa baba sa Guadalupe River. Unya kusog kaayo ang current sa tubig. If in-ani man gud ang panahon ang tubig sa bukid ug tubig sa dagat mag-abot,” Romarate said. As of 8 p.m. CCDRRMO personnel continue the search and rescue operation for the teenager. “If in-ani gani ang panahon, kanang lugara zero visibility gyud na ang kabaybayonan,” Romarate said. In Barangay Mabolo, an old woman was also rescued by the CCDRRMO personnel after floodwater at the Mahiga Creek rose to a critical level. Harold Alcontin said the woman is living within the three-meter easement zone. “Naa siya dapit sa river nagpuyo unya wala man dayon siya mohawa. Mao to pagtaas sa tubig gidali-dali siya pagtabang. Tiguwang naman sad naglisod na lakaw,” Alcontin said. According to him, residents living near the creek were advised to evacuate during the heavy rain yesterday. “Nag-prepare sila if mokusog gyud. Niya giwarningan nga if in case mograbe ang baha, pugson gyud sila pagpa-eva-cuate,” he said. CCDRRMO head and Councilor Dave Tumulak said two people were also rescued from the flood in Barangay Lahug. Eduardo Benting, 8, and Danilo Kopta, 53, were almost swept by flood while trying to cross the river. There were reported minor landslides in Barangays Sapangdaku and Malubog. No injury, however, was reported. Several vehicles were also stranded at the North Reclamation Area because of the floodwater. The city government deployed 10 Kaohsiung buses to ferry the stranded passengers. Most of the flooded areas were in the downtown: D. Jakosalem Street, Colon Street, and Sanciangko Street. CCDRRMO has immediately coordinated with different barangay captains to check on possible incidents that need assistance from the city government. Philippine Atmosphe-ric, Geophysical and Astronomical Services Administration Visayas chief Oscar Tabada earlier said that Central Visayas will experience cloudy with light to moderate rain showers and thunderstorms in the afternoon or in the evening from Thursday until Sunday.